First observed in 2005 by NASA’s Cassini spacecraft as it orbited the ringed planet, the plume is coming from a subterranean, salty ocean beneath the moon’s surface. The latest Cassini observations by a team including Larry Esposito, LASP planetary scientist and University of Colorado Boulder professor, indicate at least some of the narrow jets there blast with increased fury when the moon is farther from Saturn. Exactly how that is happening is far from clear, said Esposito, principal investigator for the Cassini Ultraviolet Imaging Spectrograph (UVIS) designed and built at LASP. But the observations give theorists new possibilities to ponder regarding the twists and turns in the “plumbing” under the moon’s surface. Scientists are increasingly eager to understand the phenomenon, since the hidden ocean could harbor the ingredients for life. The latest measurements were made in March, when the UVIS instrument was pointed toward Epsilon Orionis, the central star in Orion’s Belt. 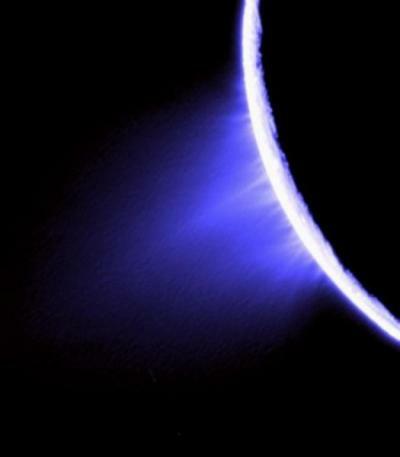 As Enceladus and its erupting plume drifted between the Cassini spacecraft and the star, UVIS measured how the water vapor in the plume dimmed the star’s ultraviolet light, revealing how much gas the plume contained. Previous observations with Cassini’s cameras showed the eruptions were spraying about three times as much icy dust into space when Enceladus neared the farthest point in its elliptical obit around Saturn. But the new UVIS observations showed the water vapor output—which makes up to 90 percent of the material in the plume—bumped up only about 15 percent. Cassini cameras previously had shown the broad plume of gas and dust-sized ice grains are coming from the south pole region of Enceladus and extend more than a thousand miles into space. Scores of narrow jets erupt along great fractures on the moon known as “tiger stripes” and contribute to the plume. Candy Hansen of the Planetary Science Institute in Tucson, Arizona, part of the UVIS team, says the the new observations are somewhat puzzling. The UVIS team focused its attention on one jet known informally as “Baghdad I.” The researchers found while the amount of gas in the overall plume didn’t change substantially, this particular jet was four times more active than at other times in Enceladus’ orbit, supplying about eight percent of the plume’s total water vapor at its peak. This insight revealed something subtle but important, says Esposito. This increase in the jets’ activity is what causes more icy dust grains to be lofted into space, where Cassini’s cameras can see them, Esposito explains. With the new data Cassini has provided, the UVIS team is now relying on theoreticians. “Since we can only see what’s going on above the surface, at the end of the day it’s up to the modelers to take this data and figure out what’s going on underground,” Hansen explains. In March 2015 a team of Cassini scientists led by LASP research associate Sean Hsu showed that microscopic grains of rock grains emanating from Enceladus implied there was hydrothermal activity taking place within Enceladus. Such activity requires hot water, which scientists believe may enhance the possibility of life within the moon. The Cassini-Huygens mission is a cooperative project of NASA, the European Space Agency and the Italian Space Agency. The Jet Propulsion Laboratory, a division of the California Institute of Technology in Pasadena, manages the mission for NASA’s Science Mission Directorate in Washington.